Where-oh-where is spring??? We’ve been trying to fit owl-banding into the breaks in the cold and windy weather, but have only managed to make it out a few times in the last week. Warm temperatures of 52 degrees F greeted volunteers this evening. The melting of snow received the previous two days is well underway. Prior to opening, Andrea did additional trimming along the aerial net lanes. Winds, which were stronger earlier in the day, were calm at opening. But… there were no owls. Canada Geese were heard off in the distance, but no owls were encountered. Approaching rainy and windy weather resulted in the closing of nets for the evening at the 2.75 hour. Thank you to Andrea, David, Leanna, and her son Colin for their help! It was a chilly evening, but the sky was clear and the wind was quiet. The Braddock Bay Raptor Research Volunteer Class came for a visit, and the nine guests were treated to a Saw-whet Owl about two hours into the evening. The second-year female was exceptionally cooperative and docile as she blinked lazily at us. We banded her quickly, let everyone snap a photo, and then perched her on a tree outside the station. We were hopeful for more Saw-whets or even a Screech Owl, but our night ended empty handed. Thanks to Barb, Gayle and Laura who helped this evening. Andrea Patterson	Spring Banding	Comments Off on The Saw-whets Have Arrived! Tuesday March 11, 2013: What an exciting night we had this evening! Barb and I dutifully headed out to BBBO for our spring owl project. We noted with dismay the soggy snow that barely camouflaged the puddles of water underneath, but we decided wet feet were just part of the job. We opened our nets, and for the first 2 hours saw and heard nothing. At hour 2.5, I went to check the nets and clearly heard a Saw-whet yipping in the trees behind the aerials. At hour 3, Barb went to check the nets and I checked my email. About three minutes after she left the building, Barb called me saying “I have two owls, no bags, and only two hands!” I ran out to help, and we discovered that there were actually four Saw-whets in our nets! One pulled a little Houdini maneuver and escaped before we were able to secure it, but we safely extracted the other three and took them back to the station. Barb banded the first owl (our first of the season, and her first ever) – a hefty girl weighing about 108g. We aged her as an after-third year, meaning she hatched in 2011 or before. Then, she went out to check the nets again while I banded the last two owls. Both were third-year females, and both were smaller and lighter than the first. Our first Saw-whet of the spring. It was also Barb’s first owl extraction, and banding! We didn’t see or hear any other Saw-whets this evening, although we did recapture our first owl just as we were closing. We also heard at least one Screech Owl calling. We will not be banding Wednesday, and we are waiting to see what Thursday looks like. Visitors are always welcome, but it is a good idea to call the station before you come out to make certain we are there. If we don’t answer, try again in about 15 minutes just in case we are out at the nets. Our third owl, looking fierce! 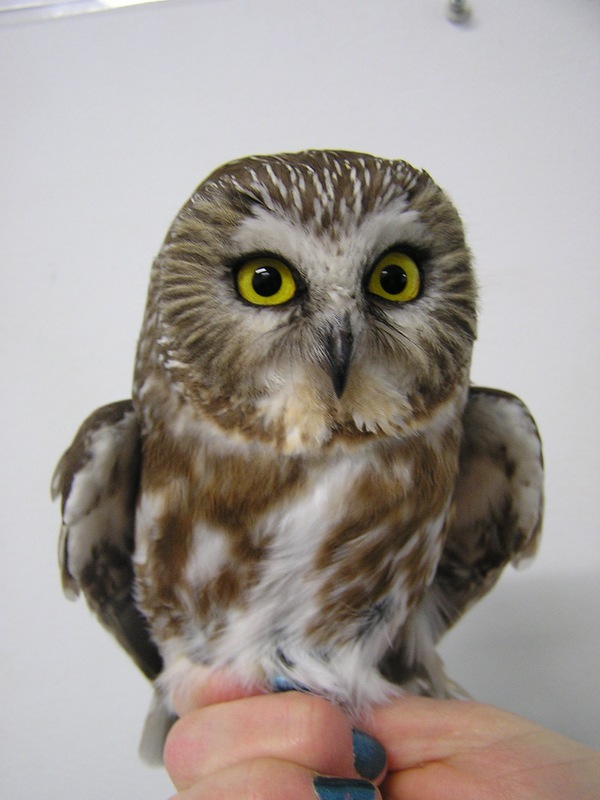 March 10, 2013: A hardy crew of six banders gathered at BBBO this evening to start the spring owl banding season. 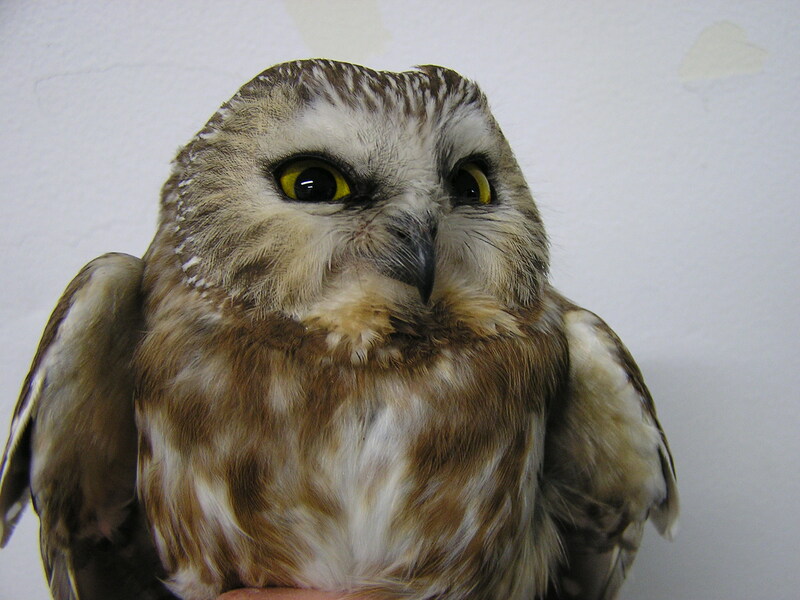 We set up eight nets designed to catch Northern Saw-whet Owls, and two nets designed to catch larger owls. Although we diligently checked the nets every half hour (tromping through the slumpy dumpy snow), we came up empty handed every time. We were skunked! And then . . . Dave Mathiason got skunked for real! On one of his forays out to the large-owl nets, he nearly ran into a black and white critter that managed to spritz him with a little bit of skunkiness. Dave was kind enough to bring the scent back to the boathouse for everyone to enjoy. And if everyone else is like me, their clothes are sitting in plastic bags in the car, waiting to be washed in tomato juice! I wasn’t even sprayed by the skunk, and I’m still reeling from the odor! We’ll be out again Tuesday night, if anyone wants to stop by and take a late-night walk through the woods. Park on the street unless you are prepared to leave your car in the parking lot until the snow melts, wear sturdy waterproof boots, and bring a headlamp. Febreeze is optional . . .